Having spoken about so many challenges, Raveena has struck up with a challenging role in Kavalthurai Ungal Nanban. “In contrast to my debut film ‘Oru Kidaiyin Karunai Manu’, this one was completely different. I play the role of protagonist’s wife, a working woman, who comes across a shocking incident that changes her course of life. 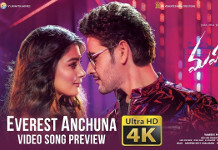 Since I hadn’t face such situations in real life, I had to prepare myself through acting workshops,” says Raveena, who adds up that there is a beautiful romantic song in this film, which the entire team is highly raving for an exquisite chemistry she shared with Suresh Ravi in a song. Featuring Suresh Ravi and Raveena Ravi in lead roles, the film directed by RDM also features Mime Gopi, Kalloori Vinoth and few more familiar actors in important roles. Adithyha-Soorya (Music), Vishnu Shri (Cinematography), Vadivel-Vimal Raj (Editor) and Rajesh (Art) form the technical crew of this film, which is produced by BR Talkies Corporation in association with White Moon Talkies.